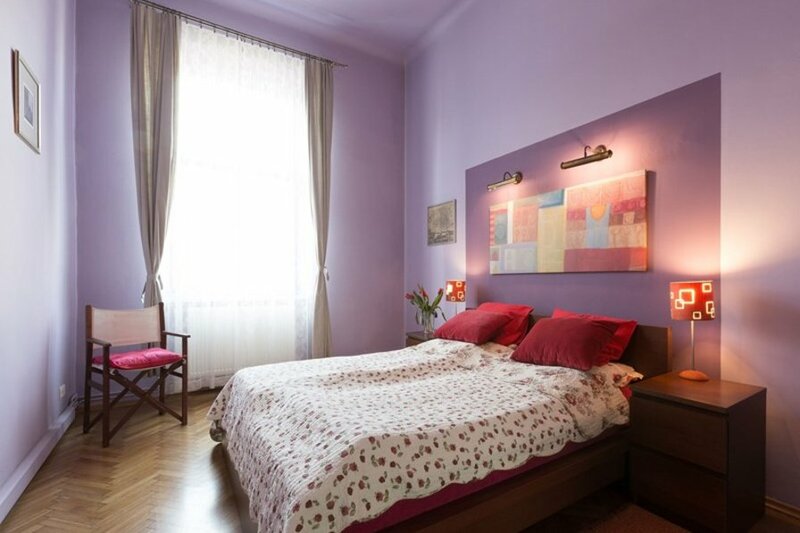 Situated in a strategic central location, close to the Main Square of Krakow and the trendy Jewish Quarter Kazimierz, spectacular luxury two bedroom first floor apartment, newly decorated & fitted. In a building from the end of the 19th cent., this bright and newly fully redesigned apartment is in a prime central location for holidays and business alike. All tourist attractions are easily accessible (Krakow Old Town and Kazimierz). You will find our Apartment thoroughly & stylishly furnished with original features, luxury bathroom & comfortable bedrooms. Finished to the highest standard, this amazing apartment will give you all the style and luxury of a Boutique hotel but at a fraction of the cost. Tram stations (2min.) provide quick & easy access to all parts of Krakow. Our modern furnished Lounge offers you impressive space with large comfortable sofa (double pull-out bed) and specially designed lighting system, a large south-facing window overlooking wild backyard garden, besides practical things like TV-set, Stereo+CD, VCR, DVD. Our two Bedrooms offer you comfortable Queen size beds, cozy lighting and impressive space, due to the high ceiling. Besides there are fitted wardrobes and a safe. Equipped with a combined bath&shower, towel warmer, washing basin, toilet and a washing machine our bathroom has all it takes to use a bathroom in high standard. A small balcony is overlooking the wild backyard garden. The apartment is situated in a strategic central location, close to the Main Square of Krakow and the trendy Jewish Quarter Kazimierz. For those who are interested in visiting historic monuments, museums, galleries, churches and synagogues, our apartment is a perfect starting point. Not far from our apartment is a greens market, an ice field, flea market and much more! There is also a guarded parking area just behind the house. Krakow is only 20 min. from Wieliczka (worldwide unique salt mines), 30 min. from National Ojcowski Park, 90 min. from Oswiecim (Aushwitz) and 2 hours from the Tatra mountains.